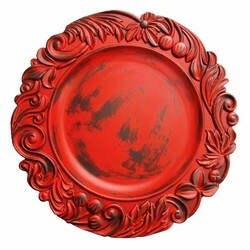 Charget by Jay Aristocrat Red Oak Charger Plate 13"
Home > Products > Charget by Jay Aristocrat Red Oak Charger Plate 13"
This extremely elegant charger plate features a carved-style design in aristocrat red oak. Made from acrylic, this 14-inch charger’s finish features a burnished pattern. The charger is extremely lightweight and should be wiped clean after use.